The Full Scene Antialiasing is generated by your computer’s graphic card it provides a smooth line display in OpenGL. This antialiasing will not only antialias your drawings but all your different views in the interface. 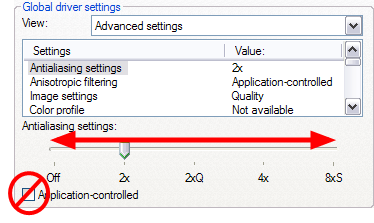 This preference can be turned on or off, Full Scene Antialiasing preference is disabled by default. This option lets you see smooth lines as you draw as well as an antialiased drawing area. You can change the value of the Full Scene Antialiasing using the Preferences dialog box to fit the current level used in the Camera or Drawing view. 1. Select Edit > Preferences > OpenGL tab (Windows) or Animate Pro > Preferences > OpenGL tab (Mac OS X). 2. In the Full Scene Antialiasing section, select the Enable option. 3. In the Number or samples (For Mac OS), enter the number of samples you want to be used for the antialiasing process. The number of samples is basically equivalent to the amount of time a pixel will be enlarged to calculate the antialiasing. This technique is called supersampling. The higher the number of samples, the better the antialiasing quality will be, but the longer it will take to calculate. The recommended value is 4. 4. Restart Toon Boom Animate Pro.